Russian President Dmitry Medvedev called the International Space Station early Monday to mark the 49th anniversary of Yuri Gagarin's historic flight, suggesting an international space summit to discuss ongoing and future cooperative ventures on the high frontier. "Space is our highest priority, regardless of how hard the economic situation is in the country," Medvedev said in translated remarks. "Space will always remain our priority. This is not just somebody's interpretation, it's our official state position. I am here in my presidential office and when addressing you, I can confirm again the significance of space for the government." "We want to thank you again for today's holiday," station commander Oleg Kotov replied. All six Expedition 23 crew members - Kotov, Alexander Skvortsov, Mikhail Kornienko, Tracy Caldwell Dyson, Timothy Creamer and Soichi Noguchi - gathered for the conversation in the U.S. Destiny laboratory module. "On behalf of all of us here on the International Space Station, including our shuttle colleagues, we just want to wish everyone congratulations on this historic day," Caldwell Dyson told the Russian president. "It means as much to us for the event of Yuri's first launch as it does for all of the people involved in making this space program possible. We're all filled with gratitude and appreciation. Congratulations to all of you." Medvedev told the space station crew that in the early years of the space program, "development of cosmonautics was based on ideology and now, this is the area where we should try to assist each other in creating the mechanisms that will yield collective results. And this cooperation, I believe, is extremely important for the future, taking into account that space programs become more and more complicated, more and more costly, and the goals that we set become more and more complicated. "No country can develop space alone, we need to combine our efforts and we need to talk about it more often," he said. "So maybe we could have some sort of international meeting, maybe at the heads of governments level. Because we talk about various issues, such as tackling all kinds of challenges, dangers and hazards that humanity is facing these days, various disarmament programs, etc., but there is a very important and positive factor that unites us all. So maybe it would be good to have a summit, maybe at the heads of governments level, for the countries that are working in space. So see, I have a very good idea on this holiday. What do you think? We could invite you to participate as well." Kotov called the International Space Station "a great example of international cooperation where we have two completely different technical schools, Russian and U.S., and we combine our effort, we found the interfaces not only for machines but also for humans and we've created this wonderful, fully functional station ... and that is something that should be used in the future. "Together, we have created a single organism," Kotov said. "The crew functions as one body even though it consists of representatives from different countries. We have had a European astronaut on board, we have Japanese astronauts on board right now, we have American astronauts, Russian, and we understand each other perfectly, we don't have any conflicts and I hope this will be true also regarding our cooperation everywhere else." "Oleg, those are very good words, it's nice to hear that," Medvedev replied. Then he changed the subject, saying "I think it will be a mistake if I don't ask you some simple questions. How's life?" "Well, it's like one of the most popular questions that we're asked - what do you like best in space?" Kotov said. "And my answer is always two things: weightlessness and the view out of the window. Also, just life in this three dimensional space, where walls and floor and ceiling become all the same. That's very interesting, and it takes changing your mind the way you think about your surroundings." 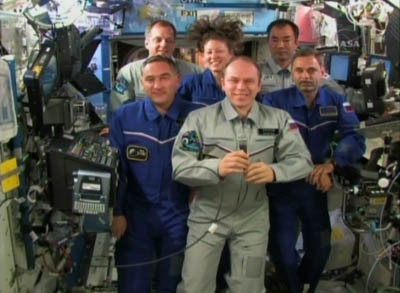 Medvedev asked if the absence of gravity caused any problems for the station crew. "I can tell you honestly in my first flight, I noticed one month into the flight I had this feeling as though I had been living in space and weightlessness my entire life, it became such a natural part of my thinking that I didn't have any problems," Kotov said. "Everything was so natural, so pleasant, so comfortable, you get used to all the minor negative details of being in weightless, you begin to enjoy the positives tremendously. And that's something you don't forget and your body remembers that. It was interesting. After I came back to Earth, I was uncomfortable, actually, experiencing Earth's gravitation. To me, it was strange to see the people not only walking on the surface of the planet, but also running. It seemed very difficult." Medvedev asked about the food on the International Space Station, wondering "are they feeding you well?" "Food in space is different from the ideas people have based on what they knew in the 60s or 70s," Kotov said. "The food becomes more and more similar to what we eat on Earth. We don't have any tubes. We do have cans and the variety is pretty good. Because we're using the resources of all the space agencies, we have a very international cuisine. We have Japanese food, we have American food, European style, no complaints here."